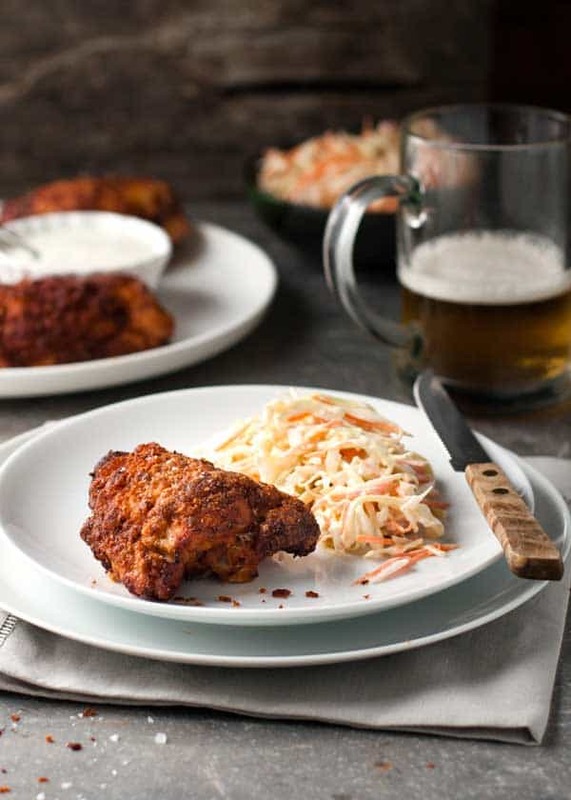 All the flavour and crunch of Southern fried chicken…but made a whole lot healthier by baking! 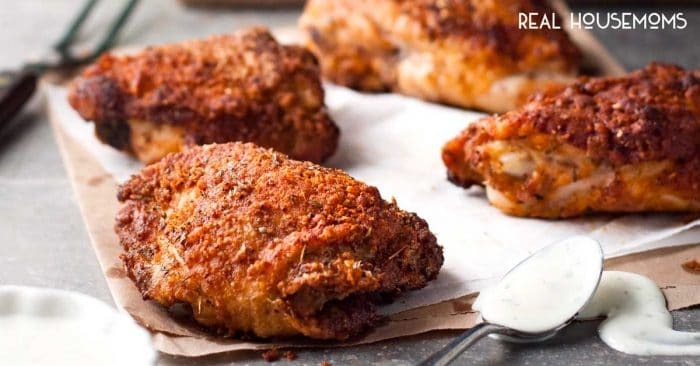 I love this SOUTHERN OVEN “FRIED” CHICKEN! This is how the conversation went when my friend saw me editing these photos. “Oooh! 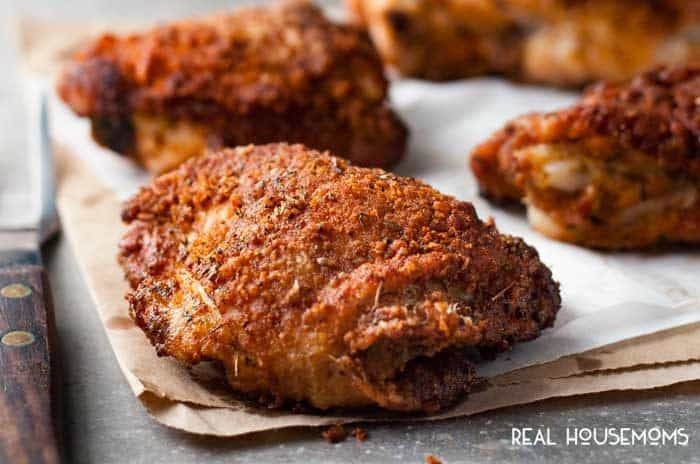 Fried Chicken – YUM!, he exclaimed. “Nope, not fried. Baked,” I said smugly. YES. I swear. These are made in the oven. Are you as amazed as he was?? As insulted as I was that he would question my integrity, I was busting to prove that I wasn’t lying (let’s be honest, I just wanted to say “See? I TOLD YOU SO!”) so I made it again the next day. Not that it was any sort of hardship, having to make it again. I could seriously eat this every day. Because, my friends, the plain fact is this: I love fried foods. I have a theory that anything is made delicious by frying it. And I can’t think of any fried food that I wouldn’t happily munch on. But as much as I love fried foods….I hate deep frying myself. Partly because I have a fear of frying (at my very core, I am quite a klutz) and also because I feel like it’s a waste of oil. So I have many baked versions of classic fried foods. 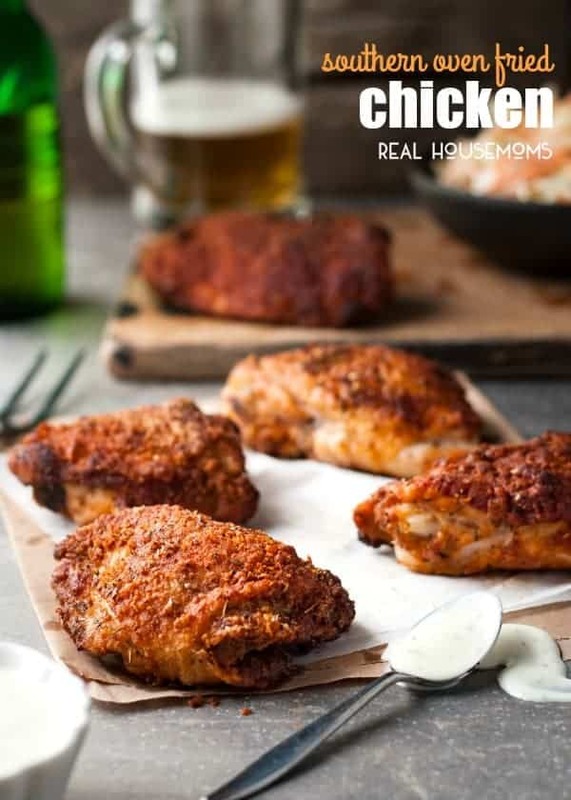 This is one of my favorites, along with my KFC Oven Fried Chicken Tenders (seriously – tastes just like KFC!). Don’t skip the marinating! It’s key to get flavour into the flesh of the chicken. Promise me you won’t skip it! Southern Fried Chicken....made in the OVEN!!! You won't believe how amazing these taste! Add half Spice Mix into the Buttermilk in a ziplock bag. Add chicken and marinate overnight, up to 24 hours. Combine remaining Spice Mix with Coating in a bowl. Remove chicken from buttermilk, shaking off excess. Dip piece into egg, then coat in Coating. Shake off excess. Place on tray. Repeat with remaining chicken. Bake for 45 minutes or until deep golden brown and juices run clear when chicken is pierced. 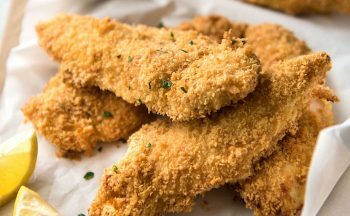 If you enjoyed this recipe, I think you’ll love these crunchy Oven Fried Parmesan Chicken Tenders! do you have the nutrition make up on this chicken? You should now see the nutritional facts at the end of the recipe.